After the first wave, only darkness remains. After the second, only the lucky escape. And after the third, only the unlucky survive. After the fourth wave, only one rule applies: Trust no one. 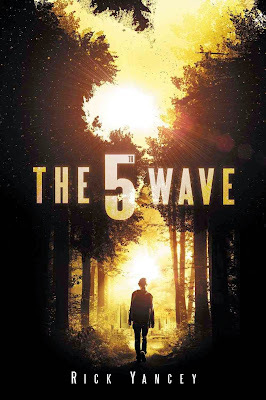 Now, it’s the dawn of the fifth wave, and on a lonely stretch of highway, Cassie runs from Them. The beings who only look human, who roam the countryside killing anyone they see. Who have scattered Earth’s last survivors. To stay alone is to stay alive, Cassie believes, until she meets Evan Walker. Beguiling and mysterious, Evan Walker may be Cassie’s only hope for rescuing her brother, or even saving herself. But Cassie must choose: Between trust and despair, between defiance and surrender, between life and death. To give up or to get up. If you only read one book this year, this is the one. It's phenomenal. Scientists and conspiracy theorists have always speculated that they had arrived... And all it took was ten days. Ten days before they unleashed the first wave, blasting the planet into darkness. Some assumed they came bringing peace on earth, others believed they were coming to save us from ourselves. But they weren't. They were coming to kill us, pit us against one another, to take our planet and purge us from existence. When the second wave hit, it was designed to cleanse the earth. Tsunamis devastated coastal town and cities. But the world survived. The third wave was created to decimate millions of survivors. A virus spread from human to human. Only the strong will survive, and the Sullivan's are survivors. Cassie, short for Cassiopeia is sixteen. Before the others arrived, she was your regular teenage girl. She attended school, she especially enjoyed seeing Ben Parish strut through the halls. She isn't the same girl anymore. Now she's the teen who camps alone, in a dense forest with a rifle and a teddy bear, waiting for them to discover her... The fourth wave, the silencers. They look human, you don't know that you've been discovered until the split second before you're blown to pieces, so when Cassie is wounded on a desolate highway, she has two choices. Stay and bleed to death, or run and be gunned down. Evan, the quiet farm boy with the soft hands nurses Cassie back to health. He's all alone, with no family to speak of. Cassie fascinates him, and will do anything to protect her. So when she sets off to find Sam, her little brother on a suicide mission, Evan is right behind her. The soldiers have been collecting children and taking them to camp Haven, with the promise that they are safe and their families will be joining them soon. Something isn't right, the visitors aren't claiming earth just yet, they are allowing mass camps where the remaining humans are amassing, where they have electricity and security. Don't become complacent, we are losing our humanity, losing our planet and a war against a faceless enemy... The 5th Wave is coming. The 5th Wave is incredible. An science fiction, apocalyptic story about hope, survival, love and not going down without a fight. Seen through the eyes of female protagonist Cassie, then chapters as seen from Evan, Zombie (a newly recruited soldier) and Sam, Cassie's little brother. Cassie is a brilliant character, she believes she may very well be the last survivor. She carries around Sam's teddy bear as a promise and writes a journal to keep herself sane. She's tough, she's a survivor. The story is horrific in places and will keep you guessing throughout. It's intelligent, emotional and exhilarating. It's a thriller of epic proportions. I was on the verge of self destruction once I reached slight cliffhanger masquerading as an ending. I would beg, borrow and steal for a copy of the second book in this brilliant trilogy. I'm so thankful I look a chance on a apocalyptic, science fiction, survivalist novel about aliens, it's truly, hands down, the best book I've read thus far... Ever.